Was tried and found guilty of desertion. Notations from the War Department Adjutant General's Office dated 19 August 1897 stated, "charges no longer stand." 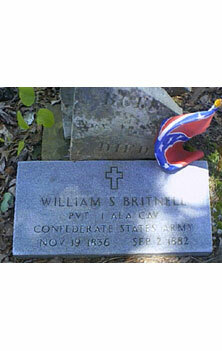 Was also a Lieutenant with PD Roddy's 4th Alabama (CS) cavalry. Currently buried under a 1st Alabama CS headstone. Picture submitted by Roger & Mary Anne Reynolds.